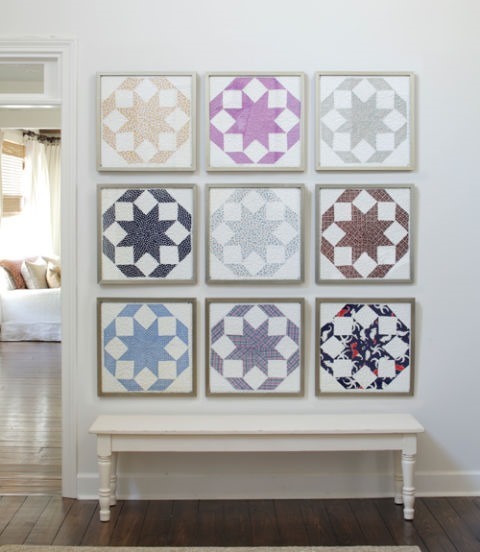 I’ve always loved this block in antique quilts but seeing them all framed like that got me hooked. I tried to make the block sizing similar to that in the photo, and maybe I’ll make this quilt again soon just to frame the blocks. 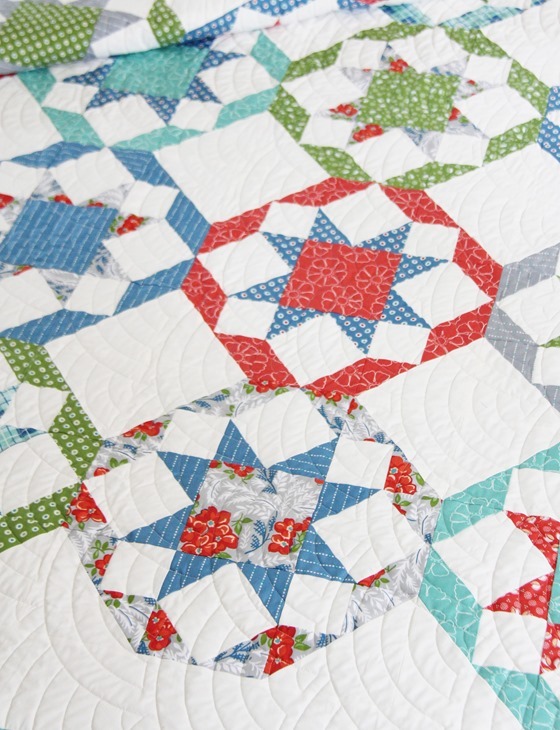 The fabrics in this quilt are Hazel, and the quilting pattern is a Baptist fan quilted by Melissa at Sew Shabby Quilting. This one is a Large Throw/Twin size, and the pattern includes instructions for a Queen and King as well. A King size of this is definitely my summer project list! This is absolutely beautiful! Love the pattern and that fabric! Can't wait to get my hands on some Hazel! Hazel is such a beautiful line! 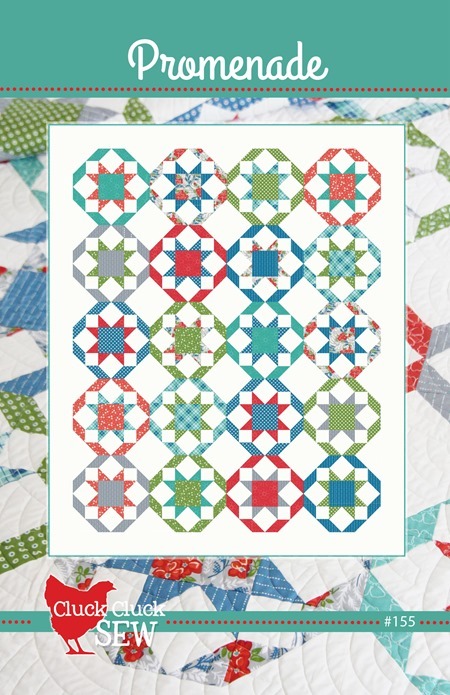 This is a fun quilt, a nice balance of modern and traditional. 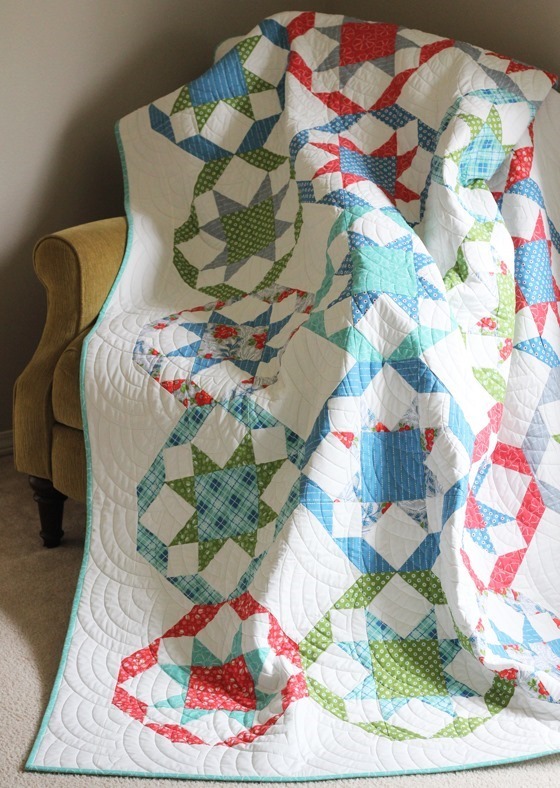 I LOVE your Promenade Quilt in your new Hazel line! This is a beautiful pattern. And, I can hardly wait for Hazel to be out!! They are a favorite color combination! Beautiful pattern! I love the colors you used and your design of the pattern cover. Your quilt is beautiful! I love the colors! The quilt is beautiful and I really love this fabric! I cannot wait until it is available. beautiful, and I too love the framing idea! Looks like a great quilt! I like the blocks on the walls too!! I can hardly wait for Hazel to arrive!!! Love your Promenade quilt too! 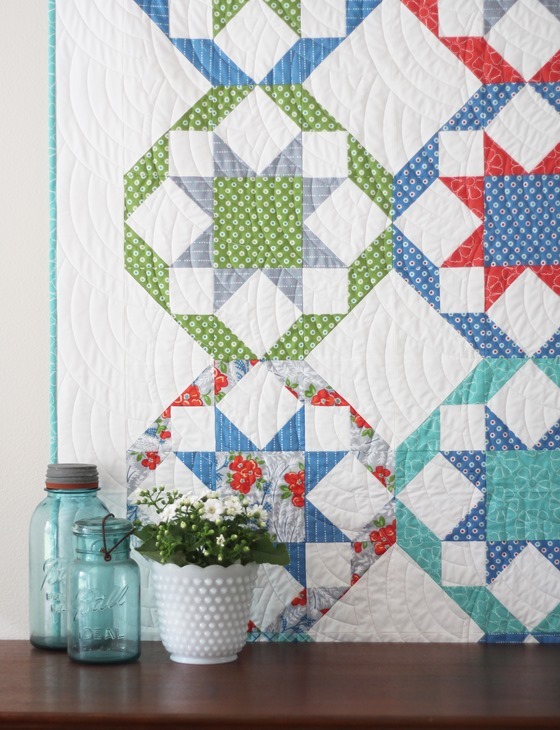 Love the fabrics and design of this quilt! It's very pretty. I love the colors! This could be my favourite one yet! I love this pattern and it's perfect in Hazel! This is so beautiful. I think this is my favorite quilt you've ever made! Love the new pattern! Those framed blocks are so great. Want them! Love it (as well as all the other new patterns you released)! And, framing the blocks is such a great idea! I somehow missed this post and quilt. Yikes. This one is adorable. Oh, this is lovely! And such fresh and pretty colors.